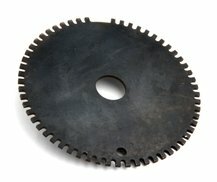 7 ¾” crank trigger wheel Blank. 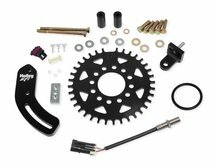 Black crank trigger kit for use with MSD 6, 7 or 8-series ignition and timing accessories. Use this replacement harness to connect your MSD to your distributor or crank trigger. Crank trigger kit for use with MSD 6, 7 or 8-series ignition and timing accessories. 3/4"-16 thread Hall effect sensor. Magnetic pickup for old style crank triggers only. Timing tape for big block Chrysler with 7-1/4" balancer. Timing tape for Chevrolet with 7" balancer. Timing tape for Chevrolet with 8" balancer. Limited To Stock On Hand - Timing tape for Pontiac with 5-1/4" balancer. Timing tape for small block Chevrolet with 6-3/4" balancer. Timing tape for small block Chevrolet with 6" balancer. Timing tape for small block Ford with 6-3/8" balancer. Allows precise timing adjustments on your MSD Crank Trigger system. The 3/4" diameter model is for use with MSD's Flying Magnet Crank Trigger Kits. This Shielded Magnetic pick-up Cable will help protect the trigger signal from the distributor or crank trigger pick-up from Electro Magnetic Interference (EMI). Start retard to make for easier starts on crank triggered engines. DIY crank trigger kit. Everything you need to fabricate your crank trigger system.